Red carrots. Lots of'em. Last night, for a good 5 minutes, I was a carrot feedin' machine, and their eyes were as bright and eager as any kid on Christmas day. Why red? I'm not sure the horses cared, and they're more expensive, but you have to admit they're festive, and it's a special day for them. Oh, my dappled grey also got the Horseware grey striped cooler (and matching halter) for Christmas. He looks dashing in it and get lots of compliments. I love that the fleece is so plush and wicks moisture really well. Riley will love his! My Boys got brand new feed tubs into which I put carrots with tops and apples to break them in. No red carrots around here, that I've seen. They look to be the perfect Christmas treat! I'm still a waitin' to see what will be under the tree for my girl. Today she got her pre-Christmas tree before her ride and I got my pre-Christmas fall during the ride. Note: feed treats after ride to prevent excess energy being dispensed in the form of "let's do circles as fast as I can will you try and tighten the girth, hold on and stop me all at the same time"
My guys wish they had gotten red carrots! 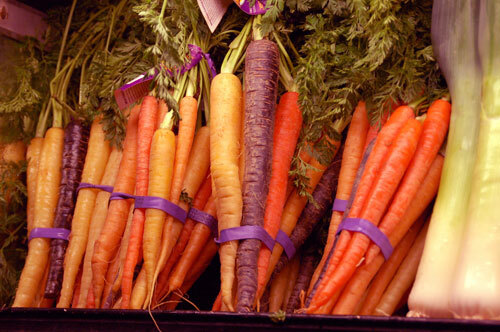 There's just something about carrots. I helped out at the barn Thursday and the horses were much more interested in my husband with the bucket of carrots than me with my pail of mash. 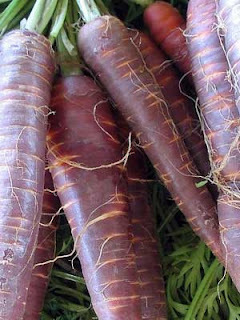 Red carrots! Neat. Although he never turns down a cookie, carrots are still my horse's preferred treat. He ate a bag of baby carrots on Christmas eve and some cookies from a horse stocking, which one of my students presented when she magically arrived at the barn. She was just like Santa! Cool never even heard of them. Merry Christmas! !